Texans who shopped for electricity in 2014 paid more on average than folks who only had one power option — but the difference was smaller than in years past. And statewide, power prices remain below the national average. 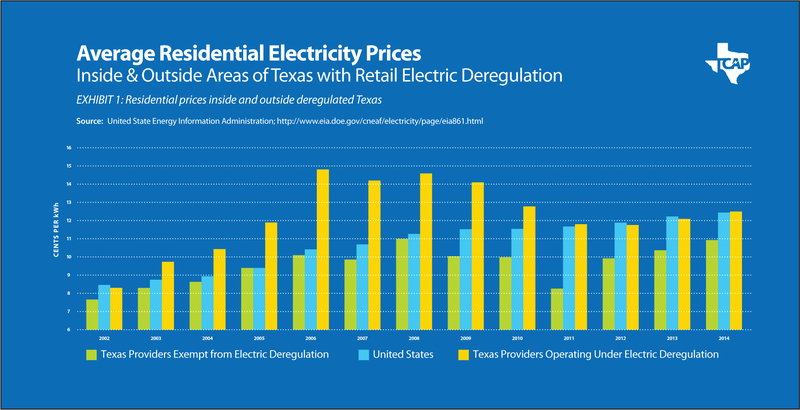 That’s according to a new study that offers a panoramic view of electricity prices in the years since Texas deregulated the power market across most of the state. In the report released Wednesday, the Texas Coalition for Affordable Power, which advocates for cities and other local governments and negotiates their power contracts, analyzed U.S. Energy Information Administration data on residential prices stretching back to 2002, the first year most Texans were allowed to choose their electricity provider under deregulation. The study showed that residential prices in deregulated markets — which cover about 85 percent of Texas — averaged 15.5 percent higher than those in regulated areas, where consumers cannot choose their providers. But that gap has been shrinking since 2011, suggesting that Texans are gradually getting more comfortable shopping for power. Texans who take the time to sort through the options in the deregulated market are increasingly finding better deals — many of which beat prices from regulated providers. Such deals “appear to be more numerous than in previous years,” the report said. Statewide, Texans tended to pay less than the national average for electricity. Taken alone, however, residents in regulated parts of Texas paid a hair above the national average of 12.52 cents per kilowatt-hour. Why the discrepancy? The coalition and other consumer groups suggest that continued inefficiencies, customer confusion and relatively high prices from legacy electric providers could be to blame. A spike in natural gas prices shortly after deregulation, followed by a steep decline in those prices, could have also helped shape the pricing trend. That's because providers got locked in to high-cost gas contracts and took years to recover. The coalition acknowledges that factor but says it doesn’t account for the trend by itself. Some electric industry officials suggest that comparing prices in deregulated and regulated areas of Texas is problematic. “Each electric service area has a host of factors that affect the price of electricity, making it nearly impossible to compare the input costs to determine retail electric costs, or what retail prices might have been,” Julia Rathgeber, president and CEO of the Association of Electric Companies of Texas, said in a statement. The 14-year-old competitive market, she added, is “benefiting customers” by offering a slew of options — including renewable energy plans and those using high-tech thermostats. Wednesday’s report also examined another major component of utility bills: fees to deliver power. 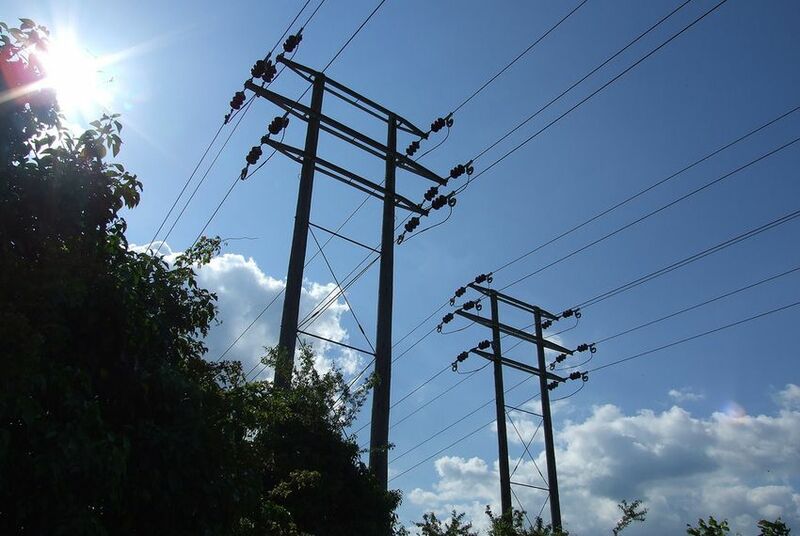 Though most Texans can choose their retail electric providers, only monopoly transmission and distribution companies can deliver it to homes and businesses. Between September 2003 and March 2016, the rates of two of Texas’ biggest power line companies — which are approved by the Public Utility Commission of Texas — increased much faster than inflation, making up an increasing share of consumers’ bills. CenterPoint, which serves the Houston area, charged $42.41 on the average monthly bill in March (for those using 1,000 kilowatt-hours of electricity), compared to $24.61 in 2003. Oncor, which serves the Dallas-Fort Worth area, increased charges to $36.87 from $23.01 during the same period. In each case, however, those prices were slightly below what the coalition reported in 2015. Texas grew rapidly during that timeframe, utility officials have pointed out, embarking on many huge transmission projects, including building new power lines to carry renewable energy and installing millions of “smart meters” to track energy use in the hopes of boosting efficiency. Disclosure: CenterPoint, Oncor and the Association of Electric Companies of Texas have been financial supporters of The Texas Tribune. A full list of Tribune donors and sponsors can be found here.